Okususobana Nature Garden covers the source area of the Susobana River. 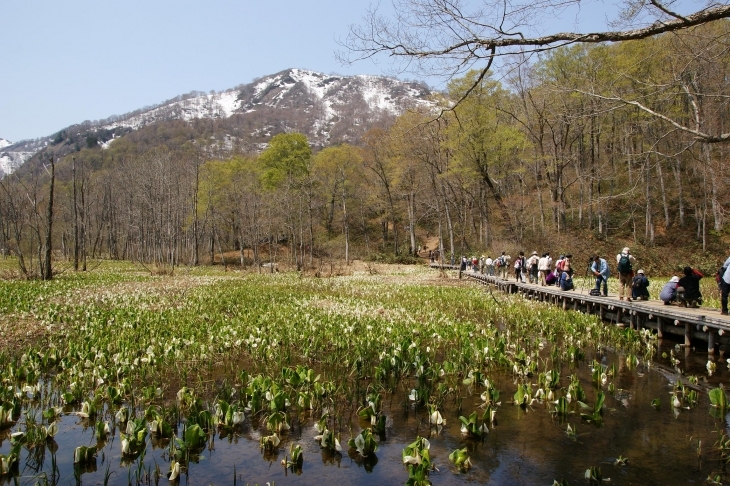 In the marsh surrounded by the virgin forest of 300 to 400-year-old beech and Japanese chestnut, about 810 thousand flowers of white arum grow in colonies, announcing the arrival of late spring to the northern Shinano region with their elegant white flowers blossoming in concurrent with the melting of snow. Then Nature Garden usually starts its operation in the latter half of April. The best season for white arum is usually in the mid-May. Fresh green covers the beech around the same time. The beech also decorates the forest with autumnal colors during fall. Approx. 50 km from Nagano IC (Between "Okususobana Natural Garden Tourist Center" and "Okususobana Nature Garden" can be accessed by shuttle bus and on foot), or approx. 2 hours on the bus to Tousist Center from JR Nagano station (seasonal operation), approx. 10 min. on shuttle bus and approx. 10 min. on foot. Closed during winter, connected roads also closed during winter.